North of Scotland GP Training: Can You Think Outside The Box? We have developed a list of practices covering the length and breadth of our region able to offer you an exciting and inspiring placement. With our huge geographical area there is something for everyone. Whether you are looking for the challenges of remote and rural practice or the hustle and bustle of inner city living, we’ll help you find the programme that suits you. We know that as a prospective GP trainee you may have questions to doctors currently in GP training. 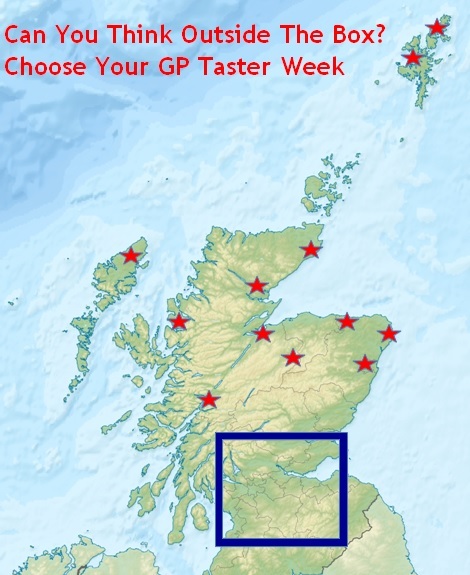 During you taster week we endeavour to put you in touch with GP trainees in your area to make sure you receive a warm welcome and get an opportunity to get all those questions answered. We hope access to this local knowledge will help you make the most of your experience. If you are taking a week off to take part in a taster week why not come to some of the most beautiful parts of our country? Whether its hiking up munros, walking on sandy beaches or exploring the forests of our national park, you will find in the North of Scotland endless opportunities to explore areas of natural beauty. Join our hard working GPs and come and get a real feel for what it is like to be a general practitioner in the North of Scotland. For more information please contact Larissa.Spindler@nes.scot.nhs.uk or come and find us at the Scottish Medical Careers Fair, Glasgow, SECC, 12th of September 2015.